The man the Fijians knew as the Shark Caller stood chest deep in water out in the bay. Amongst the villagers on the sandy shore, Nathan and Susannah watched intrigued as the old man began chanting. They gasped as a huge fin sliced through the water toward the Shark Caller. Nathan couldn’t take his eyes off the drama unfolding. The fin veered away only yards short of the Shark Caller who continued chanting as the shark began circling him. More fins appeared, smaller than the Great White’s. They, too, circled the Shark Caller, who appeared oblivious to the danger. Wild cheering broke out among the onlookers. Nathan could hardly believe his eyes. Men waiting aboard canoes in the shallows began paddling furiously out from the beach to intercept the sharks. In the lead canoe, Joeli and Waisale reached down and hauled the still-chanting Shark Caller from the water. The crews of the other canoes set about killing as many sharks as they could. 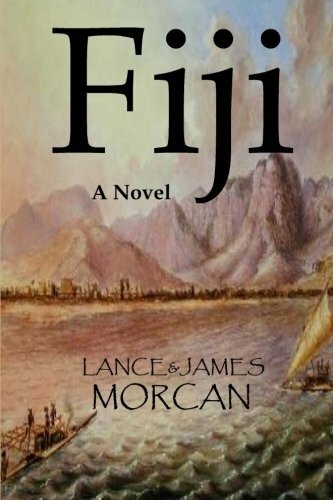 You have been reading an excerpt from Fiji: A Novel, an adventure-romance set in 19th Century Fiji.